Earth's core mantle boundary represents a phase change from a solid (though convecting) mantle to a liquid Iron/Nickel core. This dramatic transition is likely the origin of the D" boundary, as well as thermodynamic perturbations and deep mineral heterogeneities in the mantle, which cause tectonic features on Earth's surface. It is well documented that Europa and Enceladus have subsurface oceans, which represents a phase change inside the satellite's interior. Is this phase change responsible for the chaos terrain on Europa, the Tiger Stripes and volcanism on Enceladus? Or do these tectonic features originate from exterior forces, such as gravitational tides and bombardments from Jupiter/Saturn's magnetosphere? The tiger stripes of Enceladus are thought to be a result of this moon's unusual chemical composition, as opposed to any mineral heterogeneity or thermodynamic perturbations occurring due to the phase change near the rocky core. Ammonia has been found indirectly to exist on Enceladus and the unique ammonia-water composition of Enceladus is thought to give rise to the cracks in the tectonic plates on the surface, which we know as the "tiger stripes". 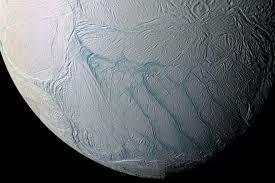 Enceladus began as a frozen shell of an ammonia and water ice mixture surrounding a rocky core. Through interaction with other moons, heat was generated above the rocky silicate core, resulting in the ice shell separating into an ammonia-enriched liquid layer directly on top of the core, and a thin layer of ice (water) above it. "We found that if a layer of pure water ice formed near the core, it would have enough buoyancy to rise upwards, and such a redistribution of mass can generate large tectonic stresses at the surface,"
"However, the pure water ice rising up is also slightly warmer which causes the separation to occur again, this time forming an ammonia-enriched ocean just under the surface. The presence of ammonia, which acts as an anti-freeze, then helps keep the ocean in its liquid state." So in this case, while one could say that the boundary may have played a role, it is certainly not analogous to the role the phase transition plays in the formation of features on Earth's surface. The linked paper provides more details as to how the ammonia-water composition can give rise to the observed terrain. With regards to the chaotic terrain of Europa, it is an active area of research and is very poorly understood. No model so far has been able to explain why features such as Conamara Chaos stand above surrounding terrain and contain matrix domes. We conclude that Europa's ocean dynamics can modulate the exchange of heat and materials between the surface and interior and explain the observed distribution of chaos terrains. It therefore seems unlikely given current research that the chaotic terrain of Europa is a result of a phase change boundary. Not the answer you're looking for? Browse other questions tagged geophysics oceanography geodynamics planetary-science tectonics or ask your own question. How does heat get transported between the surface layer, twilight zone, and the deep ocean? What is the Calcite Compensation Depth and what is its significance for carbonate deposits? What are some options for online and offline particle tracking in ocean models? How long will it take for plate tectonics to shut down and what will the effects be?